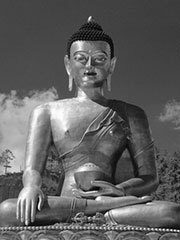 The Buddha Dordenma statue is a large bronze statue of the Buddha being constructed on the mountainside above Thimphu, the capital of Bhutan. It is sited amidst the ruins of Kuensel Phodrang, the palace of Sherab Wangchuck, the 13th Desi Druk. Upon completion in 2007 it will be the largest Buddha rupa in the world, at a height of 169 feet. The statue is being built by Aerosun Corporation of Nanjing, China, at a cost of US$20 million including shipping and installation, to commemorate the 100th anniversary of the Bhutanese monarchy. Its construction fulfills a prophecy made by Sonam Zangpo, a renowned yogi, that a large statue of either Padmasambhava, Buddha or of a phurba would be built in the region to bestow blessings, peace and happiness on the world, and to bring peace and prosperity to Bhutan.